The key to good customer service: Be respectful. Twitter is all about 140 characters. At least it was, until a couple weeks ago and that could be a problem. For the most part, tweets are public which anyone can see; no Twitter account required. On the other hand, a Twitter direct message (DM), which's limited to 140 characters, is always private. Originally, a DM couldn't be sent to any random Twitter user. The recipient has to be a follower of the sender to limit unsolicited, spammy, DMs. A smart decision. With so many other communication channels to choose from, DMs weren't nearly as popular as messaging on other platforms such, as Facebook and other mobile apps. Over the years, though, I found the perfect application for Twitter's DMs: Customer service with "Big" companies (think: oligopolies). Why can't we, as consumers, e-mail a tech support question to our ISP, phone company, etc? The answer is obvious: because Cox, AT&T, etc would be inundated with e-mail manifestos, tirades, and diatribes. However, with more and more "Big" companies using Twitter, the drama of a public customer/company battle could escalate into a PR nightmare. Enter the Twitter DM. 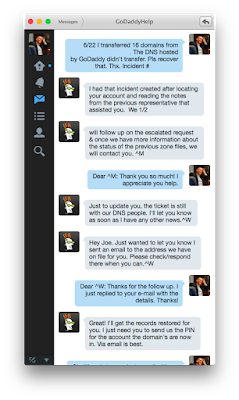 Over the past few years, when I've had a problem with Cox, AT&T, and GoDaddy, I've used Twitter DMs to get ahold of their customer service department without drama or waisting my time navigating an interactive telephone menu. "Hi, I'm having a problem with my service. Could you follow me so I can DM you?" These companies have active social media customer support personnel, so it usually takes only five or ten minutes, during business hours, before they've followed me. In many cases, they'll immediately DM me, before I've even noticed they started following me. For this to work, you need a reproducible problem. With Cox, my connectivity, which is typically 100+Mbps had dropped to less than 100Kbps. I DM'd them a screen shot of the slow bandwidth with a note that I've restarted the cable modem and other steps I took to troubleshoot the problem. They're responses have typically been, "We're seeing the same issue. We can have a technician out there, tomorrow, between 8am-noon, noon-4pm, or 4pm-8pm. Which works best for you?" Now that is amazingly quick and simple. This entire interaction might take place over the course of 30 minutes, but I actually spend less than five minutes documenting my troubleshooting steps and DMing the CSR. This technique can work for complicated support issues, too. GoDaddy consolidated my domain names into a single account, but the DNS for some of the domains didn't transfer, which I discovered the next day when incoming mail was bouncing back to the senders. I explained the issue all within 140 characters. They quickly responded that they were on it, as they reinstated the backup copies of my DNS. So, that gets to my concern. Twitter has removed the 140 character limit in DMs which could mean CSRs might be reluctant to continue using it if they begin receiving long and unreasonable messages. And I'm wondering what Twitter will gain by making this change. Of course, they could always switch back to the 140 character limit and use e-mail when needed, as GoDaddy and I did. Perhaps I'm old-fashioned, but I feel like removing the 140 character limit is the equivalent of showing up at a haiku conference and saying, "Hey, everyone, instead of doing 5-7-5, we're going to do 7-5-7 so we have more content." Yes, I'm a customer service snob. But I've been on both sides of the fence and I give as good as I expect. "Apple Crosses The Line With New iPhone Feature"